The beautiful scenery of Chang Jiang - (known to the Western World as Yangtze River) extends along Yangtse’s tributaries Shennong Brook and Daning River to the area of Lesser Three Gorges. The area of hills and gorges flanked by cliffs along the lower part of the Daning River just before its confluence with Yangtze is known as the Lesser Three Gorges. Indeed this secluded, few tens of miles long stretch of meandering Daning River has scenery very similar to that of Chang Jiang’s Three Gorges (Chang Jiang – meaning “Long River” is a Chinese name for Yangtze). 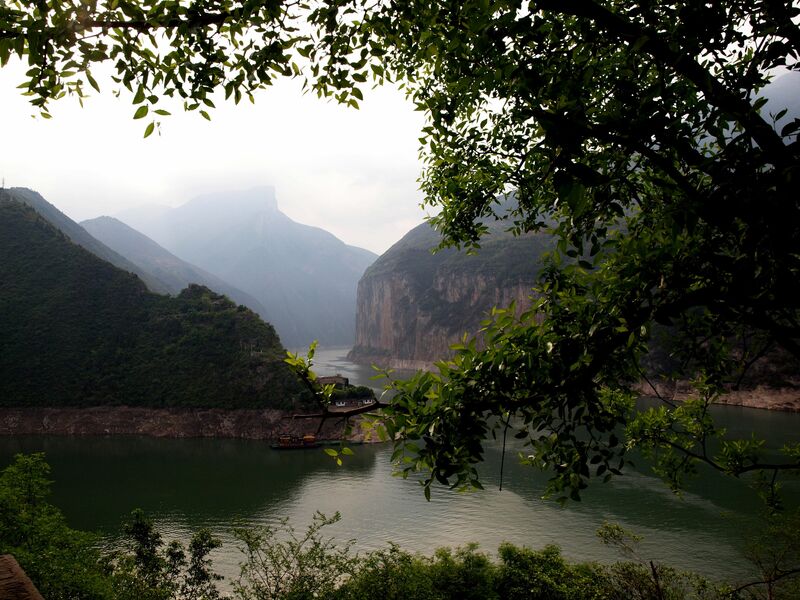 Only water with its deep emerald green color clearly differs from muddy waters carried by the Mother Yangtze. 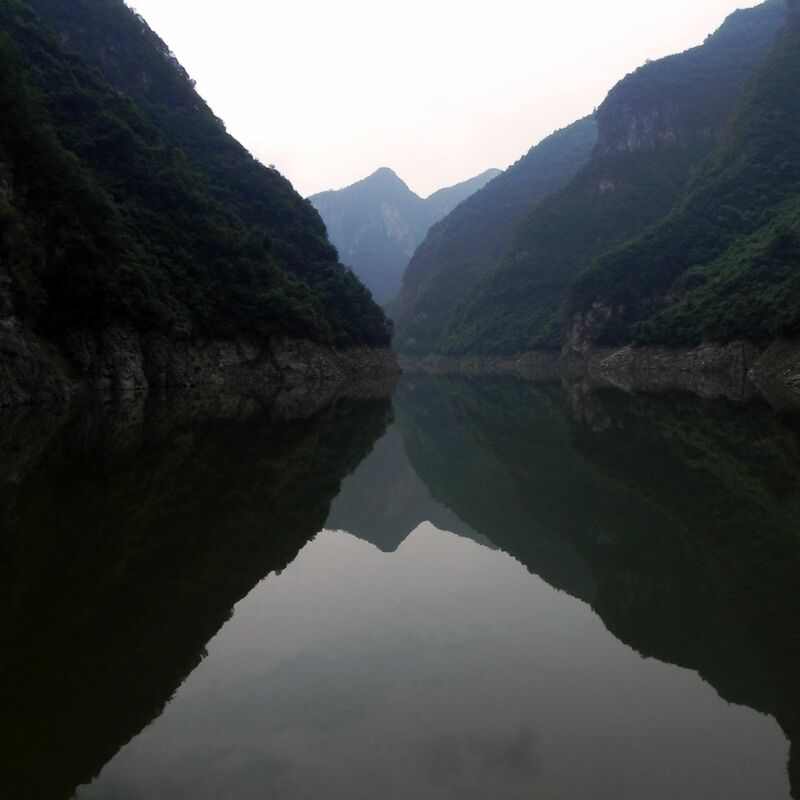 The name “Lesser” does not signify any “inferiority” of the nature, it only reflects the smaller scale of nature’s wonders represented by Longmen (“Dragon-Gate”) Gorge, Bawu (“Misty”) Gorge and Dicui (“Emerald”) Gorge compared to Yangtze’s ones. Typical landscape of Lesser Gorges - narrow water passages lined with steep cliffs and soaring peaks is beautifully interleaved with wider openings of terraced hills covered by crops. Longmen Gorge stretching from the mouth of the Daning River with its length of only 1.8 miles (3km) is the shortest of Three Lesser Gorges. Despite English “sounding”- the word “Men” is the Chinese name for “Gate”. Indeed the Longmen Gorge is an entry gate to the area of Lesser Gorges. Longmen Gorge is famous for numerous scenic sights beautifully playing with the overall landscape of narrow water passage ranging from 30 to 100 ft (10 to 30 meters) and high mountains peaks alongside soaring to 2,400 - 3,000 ft (800 to 1,000 m). In the past the gorge was part of an important commercial waterway. The long plank-road was built along the cliffs to help haulers pulling upstream cargo boats. These days only deep square holes carved in the rock for supporting beams survived weather and time. Unfortunately the rising water level due to the Three Gorges Dam submerged most of these sole witnesses of ancient bravery and engineering skills. The Bawu Gorge with length of about 6 miles (10 km) is the second one in series of Lesser Gorges. Its name – “Misty Gorge” reflects typically foggy weather conditions…. Various shapes of rocks and abundance of stalactites contribute to the fabulous scenery; while clouds of mist add the magic touch of mystery…..
Emerald Gorge with 13 miles (20km) length is the longest and the last one of Lesser Gorges. Due to shallower waters the gorge is explored on small wooden pole and oars-propelled boats. Entry to the gorge is market by “high-flying” Steel-Rope Bridge connecting flanking cliffs. The Emerald Gorge is probably the most beautiful of Three Lesser Gorges thanks to emerald-green waters and surrounding hills covered by lush vegetation. It ends at the confluence of Daning and Madu Rivers. The later opens into few more but really small and narrow gorges having names Sancheng Gorge, Qinwang Gorge and Changtan Gorge. Chang Jiang: Shennong Brook area. The Shennong Brook traverses mountainous landscape with deep valleys generously covered by vegetation. Rainy and foggy climate makes it a fertile land for plants, paradise for animal species (especially yellow monkeys and birds) and difficult territory for humans. 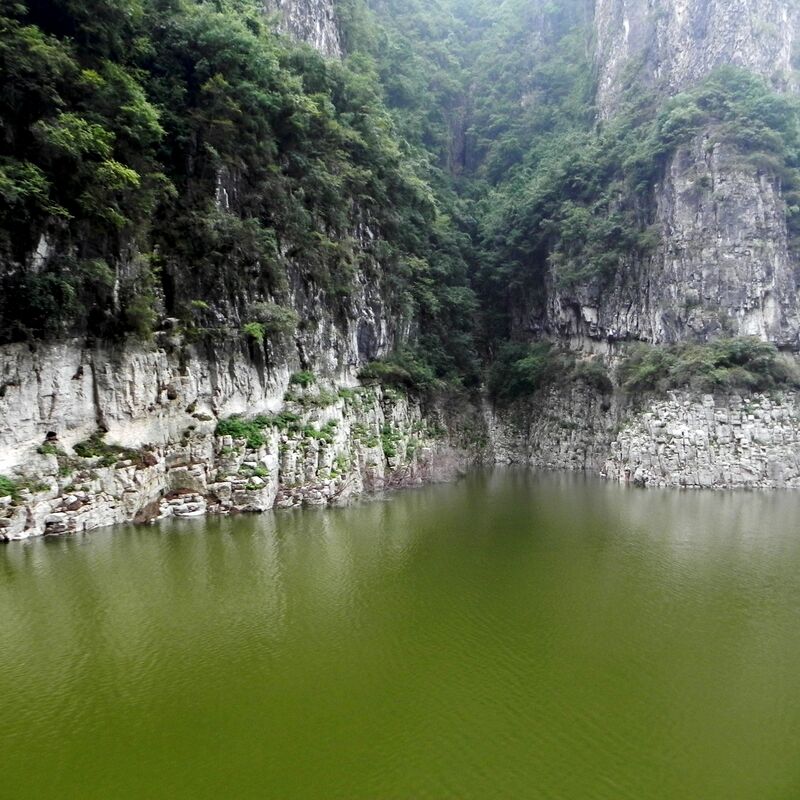 The lower part of the river flows through the Shennong Gorge characterized by vertical cliffs and narrowness. 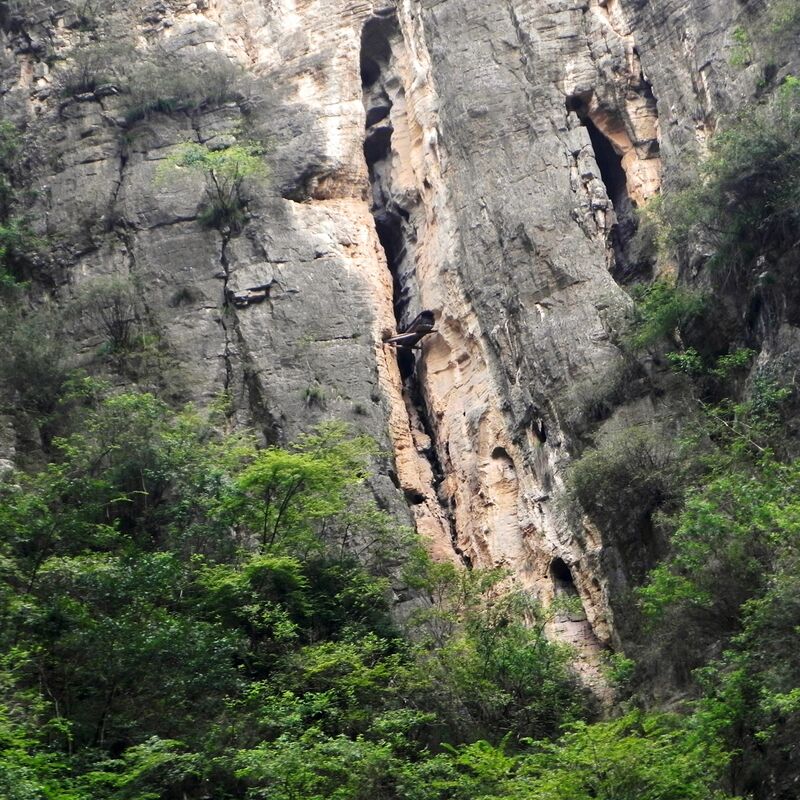 It consists of four ravines (canyons) - correspondingly Shenn Nong, Mianzhu, Parrot and Longchang. Chang Jiang: Hanging Coffins - Given the weight of few thousands pounds (about 2 tones) even today it is hard to imagine the scale of human efforts to place this coffin in such difficult and dangerous place. The Mianshu Ravine holds the natural wonder called Ray of Sunlight – a 15ft (5m) narrow passage marked by steep perpendicular cliffs reaching the high sky. It is the narrow line of sky barely visible between cliffs that gave the nickname to this passage. Stalactites adorning the cliffs just above the water level are another local curiosity. “Painted” in all shades of green by omnipresent moss they have strange, imagination inspiring forms. Yingwu (Parrot) Gorge is known for Gaoshiyan – a reddish wall of rock standing up more than 3,000ft (1,000 m) above the water. It seems to be so tall that only high flying birds dare to venture above…. Shennong Brook ravines hold many secrets. One of them are “Hanging coffins” placed in caves or suspended in the large crevasses vertically cutting the cliffs. 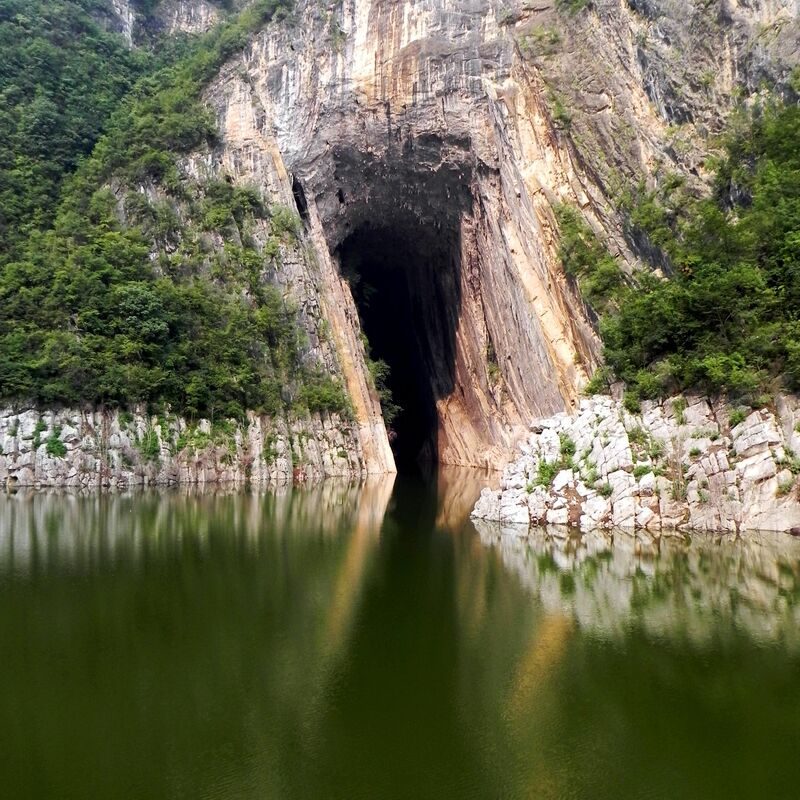 These intriguing burial places are also found in the area of the Lesser Three Gorges along the Daning River. Till our days techniques used to lift up heavy coffins facing steep rocky walls and roaring waters below are as mysterious as ancient Ba people inhabiting the area of the Qutang and Wu Gorges. Another (this time natural) wonder is the Yanziqian Karst Cave – a large and deep square opening in the cliff, colonized by thousands of fuciphagus. These little birds known as Edible-Nest Swiftlets, make nests from solidified saliva. Nests are used for famous “Bird’s nest soup” - a delicacy that most of us heard about without slightest idea about what it really is. The cave in the Parrot Gorge offers the first-hand glimpse at the “ingredients” of this gourmet dish. Between the Parrot Gorge and the Longchang one there is a small village called Longchuanhe inhabited by minority people of Tujia. In the past, men of Tujia were working as trackers hauling goods up and down the river. These brave hardworking boatmen spending all day in the water did not use any clothing to cover bodies. Apparently exposing naked bodies was not seen as shame even in the eyes of their women…. These days naked bodies of boatmen vanished from the curious eyes of visitors….. But lonely trackers’ stones dotting the riverside keep repeating stories from the past…. Due to the Three Gorges Dam the water level in Shennong Brook is much higher, so most shoals disappeared under the water. But the old traditions hold well, stories from the past are hanging in the air, echos of boatmen songs vibrate in the gorges.... And Tujia people still use sampans for transport, but this time mainly for tourists attracted by the beauty of the Shen Nong Xi Gorge. Right: The resting place of Wang Zhaojun born in the area of Three Gorges in Zigui. The tomb is located in far away Hohhot (Inner Mongolia). This photo is Not available in higher resolution. This one is actually the historical fact. Zigui (village near Three Gorges) was the birthplace of Wang Zhaojun – widely considered as one of the four beauties of the Ancient China. And what not always goes with beauty - she was also intelligent and well educated. In an attempt to safe her father from persecution she entered an imperial harem. She then took the chance to change her life by volunteering to marry Khan (leader of nomadic Hun people). Thanks to her beauty, intellect and virtues, she not only won the heart of Khan but also succeeded to unite Huns tribes with Han Dynasty ending the long period of devastating wars. For centuries she was an inspiration for poets, novelists and subject of countless tales… She found the resting place in Hohhot in Inner Mongolia where her tomb till these days is one of the most respected monuments. 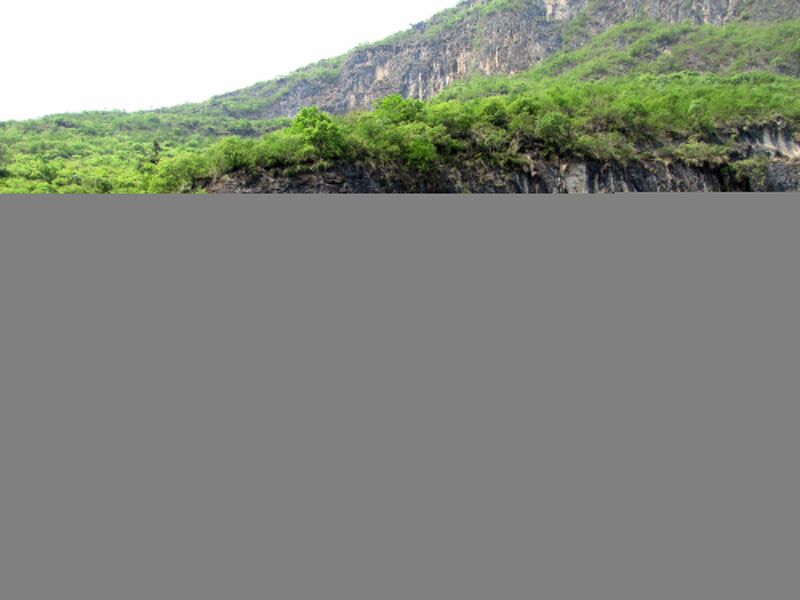 The following video may give you one more opportunity to see the beauty of the nature in Lesser Three Gorges.